When the Seattle Storefronts program took its first steps in 2010, the city was still climbing back from the economic downturn. Papered windows and empty storefronts with dusty For Lease signs were a common sight in retail areas. Shunpike, a local nonprofit devoted to helping artists with the business side of art, saw a win-win in putting temporary art installations in these empty spaces: Artists get a free, public place to display their work, and businesses get a cleaned-up, compelling storefront, one that attracts pedestrians and might even entice a full-time renter. Agreements with landlords were reached (with Shunpike acting as tenant), artist applications were selected, and Storefronts Seattle was launched, first in Pioneer Square. A clear community benefit, the program quickly expanded to several other neighborhoods. With old empty spaces getting snapped up, Blackburn has begun looking at unused space in new buildings, such as those dominating South Lake Union. For reasons that are unclear, many of the buildings that Amazon occupies contain street-level vitrines—tall, shallow, glass-fronted display cases. Since Amazon has no storefront presence, they sat empty until Shunpike struck a deal to place pop-up art in eight of the vitrines. 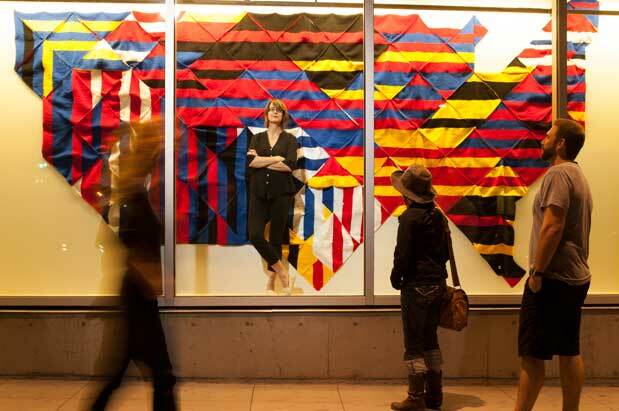 The first SLU Storefronts installations began in November 2013; as in other neighborhoods, installations run for about four months, ample time for passing techies to take a look. Blackburn says she’s been encouraging SLU Storefronts artists to think about the rapid development in that neighborhood when conceptualizing their pieces, to bring a sense of history to this shiny new world. The current roster of SLU artists and works (which will remain up through October 15) includes Kelly June Mitchell’s “Hollow Home,” in which suspended paper houses, just out of reach, speak to a nostalgic longing for comfort. Paul Komada’s “Going Cascade” is a large-scale knitted map of the U.S., with stripes reflecting westward movement to the Pacific Northwest—ages-old migrations and the current rush of tech workers. Bradly Gunn’s “Reflections of Future’s Past” is a series of historical photos of South Lake Union in which he erased buildings that have been torn down and abstracted the images to evoke the current state of the neighborhood. The vitrines not only look beautiful—as if they were intended for art all along—they bring street-level visual interest to an area known best for the computer activity thrumming beyond view. Along with a new set of recently activated window bays at the Meydenbauer Center in Bellevue, the vitrines also represent about 70 percent of the sites currently available for Storefronts artists. Blackburn reports that this installation experienced the most neighborhood engagement because it was brought out from behind the glass. While this type of pop-up comes with greater liability and cost, the discussion it inspires among the people who stumble upon it is exactly what can help ensure art remains a vibrant part of the changing city. Using “Boxed Up” as an example, Blackburn is taking a proactive stance with developers, working to create “symbiotic relationships” and prompting them to think about ways street-level art can be a boon. “You have to incentivize it,” Blackburn says, noting, for example, that businesses appreciate the fact that light and sound are deterrents to crime and can improve neighborhood safety. In addition to working with developers, Shunpike continues to seek out unused spaces at the margins. “I don’t think urban areas will ever run out of nooks and crannies,” Blackburn says. In fact, Shunpike recently made an agreement with the Seattle Center to place pop-up installations in the Fountain Rooms, starting in mid-October. Visit storefrontsseattle.com for installation updates, and save the date for the next SLU Storefronts art walk and guided tour: 12/5, 6 p.m. Meet at the intersection of Boren Avenue N and John Street.